The 2015 Nobel Prize in Physics was won by leaders of the Super-Kamiokande and SNO neutrino experiments, Takaaki Kajita and Arthur B. McDonald, respectively. The Super-Kamiokande (Super-K) experiment in Japan showed that neutrinos oscillated, and therefore had mass. The Sudbury Neutrino Observatory (SNO) experiment in Canada showed that detected solar electron neutrinos were a third of the calculated initial flux of solar electron neutrinos because they were oscillating, and reappearing as electron, muon and tau neutrinos. The sum of all neutrinos detected by their neutral weak currents was equal to the initial produced electron neutrino flux. The Neutrino properties and the experiments are explained in the Physics Nobel Prize Popular Science Background, with the more advanced version in the Scientific Background. UC Irvine has had participation in these experiments from their beginnings. Prof. Herbert Chen was the designer and initiator of the SNO experiment in 1984 before he passed away in 1987. Here is his Memorium by his UC Irvine colleagues. His UCI colleagues in the experiment were Peter Doe and John Lathrop. The idea of detecting the scattering of neutrinos off of deuterons or heavy water arose in its observation by the UCI neutrino group of Frederick Reines in an experiment at the Savannah River nuclear reactor. Herbert Chen was a co-spokesman at the start of the SNO experiment. This is noted on page 8 of the Scientific Background. 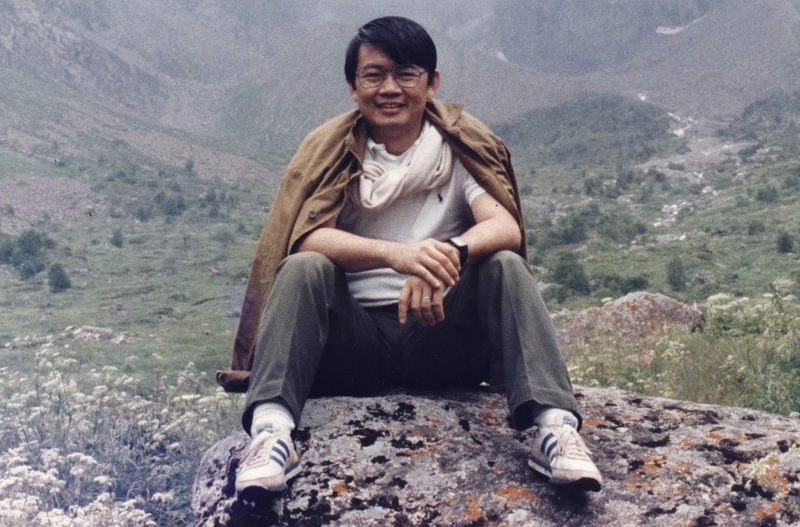 Herbert Chen’s proposal began with his Physical Review Letter with him as sole author in Vol. 55, Number 14, 1534-1536, Sept. (1985). That article was titled “Direct Approach to Resolve the Solar-Neutrino Problem”. He was an author of the “Proposal to Build a Neutrino Observatory in Sudbury, Canada” in Il Nuovo Cimento, Vol. 9 C, N. 2, Marzo-Aprile 1986. The US contributions to the Super-K experiment are from experimenters at UC Irvine, Boston University, Duke University, and Stony Brook. UC Irvine has played a leadership role in Super-K. Prof. Henry W. Sobel is co-US spokesperson, along with Jim Stone of Boston University. At UCI, the low energy analysis is headed by Michael Smy. At Boston University, Ed Kearns of Boston University and Takaaki Kajita of Tokyo University lead the high energy analysis. At UC Irvine, Prof. Henry W. Sobel, Michael Smy, Bill Kropp, Shunichi Mine, Jeff Griskevich, Prof. Mark Vagins, are contributing to the planning and running of Super-K, and the analysis of its data. The Nobel Prize for the 1998 Super-K discovery for the oscillation of atmospheric muon neutrinos was led by Takaaki Kajita. The UC Irvine group that worked on that were: T. Barszczak, D. Casper, W. Gajewski, P. G. Halverson , J. Hsu, W. R. Kropp, L. R. Price, F. Reines, M. Smy, H. W. Sobel, and M. R. Vagins. Their result was announced in the paper: Evidence for Oscillation of Atmospheric Neutrinos in Physical Review Letters, Volume 81, Number 8, p. 1562 of August 24, 1998. 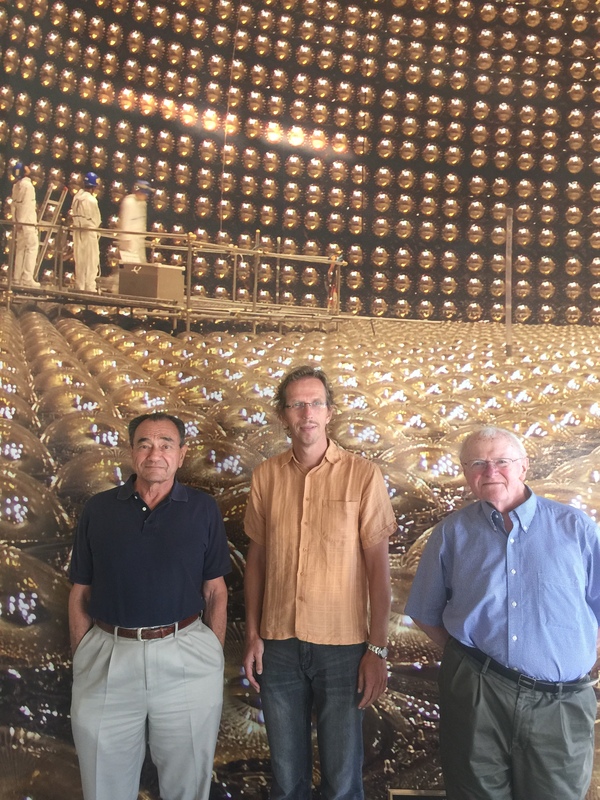 This is a new photo of Henry Sobel, Michael Smy, and William Kropp in front of a picture of the photocells in the Super-K detector. Last year I gave a course to the Osher Lifelong Learning Institute at UC Irvine on Neutrino Mysteries. It explained atmospheric neutrinos, solar neutrinos, and neutrino oscillations. It also showed the mysteries to be solved in the future. Many thanks to Henry Sobel and William Kropp for the information for this article, and to William Kropp for the picture of Herb Chen. This entry was posted in 2015 Nobel Prize in Physics, Particle Physics, UC Irvine. Bookmark the permalink.